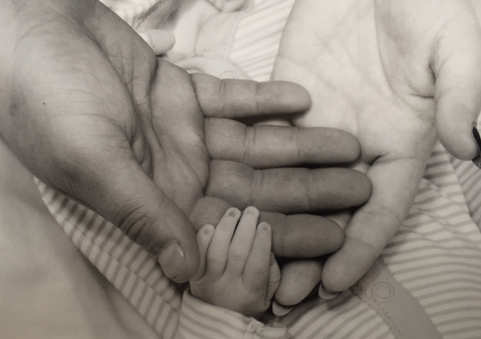 This #StillOurBaby story comes from Suzanne, and her very special little boy, Sammy. I've been speaking with Suzanne for some time now and feel honoured to be able to share Sammy's story today, on his 1st birthday. 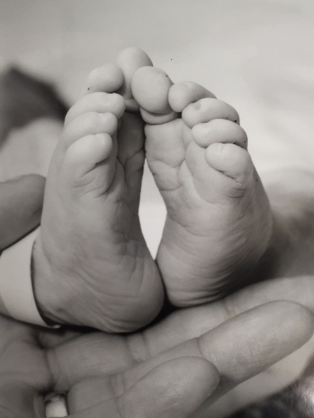 Suzanne discusses her experience with suffering from placental abruption. There are some links at the end of this post, if you would like any more information on this condition. For a long time I have been told that I have a way with words and know just what to write when it matters, however, when it comes to this, my own heart-breaking story, I have never found it so difficult to put into words the events that occurred on 6thOctober 2017. I have sat here for hours pondering on how to bring my story across to the world because unfortunately it isn’t a pretty one, but what I have come to realise is, no matter how I tell it or what I decide to put in or not put in… it ends the same way, so here goes. It is 6.30am and I am up with my first born Oliver getting him breakfast and ready for school. I was so worried about him for a while because everything was changing, he started school that September and then the new baby coming, but yet again he made me realise what an absolute angel I truly had because not only was he enjoying school and having no trouble with getting up and ready, he was super excited about being a big brother and I will forever remember him saying “Is the baby getting bigger?” excitedly as he hugged my huge round belly time and time again! I, however, am very tired, I had worked very hard the day before and didn’t sleep very well but like any Mum I have 10,000 things to do so I get cracking. After I dropped Oliver off at school I went shopping for the nights tea and headed home to get start with clearing out Oliver’s toys, after all I only have 4 weeks left before arrival so we needed the space! But after an hour or so I begin to feel achy and sore and very, very pregnant and decide that maybe this clearing out can wait so I sit down and relax for a little while. That little while turned out to be a long while, I did not remember feeling this achy with Oliver at all but I was so uncomfortable all day. 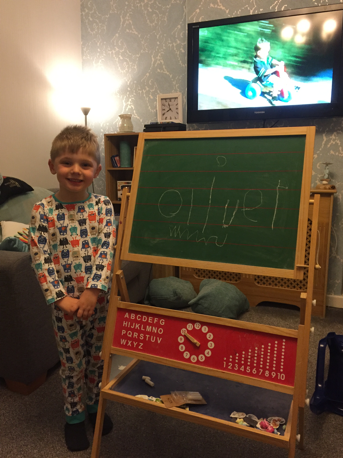 Oliver 6thOctober – Showing Mummy and Daddy what he learned that day. I screamed for Chris, who was literally in the room in seconds, and as I am attempting to get out of bed I am telling him my waters have broken and this is it but when I stand up and look at him, all I see is his pained, grey looking face before the words “that’s not water” comes out of his mouth. I look down to the bed and all I see is a large pool of blood lying on top of my mattress and then I look down to see blood pouring down my pyjama bottoms. ‘oh god, no, no, no, no! What is this? What is happening?’ I am saying internally but what comes out of my mouth is “Chris, ring an ambulance”. Everything started to slow down, I take myself into the bathroom and I sit on the toilet thinking ‘what is happening? This isn’t good?’. Chris is scrambling in pure panic trying to ring an ambulance and all I can hear him say is “She is bleeding, there is a lot of blood… its everywhere”. Chris has never been one for the phone so my logical self kicks in and start reeling off what he needs to say, which to this day I can’t quite remember. All I really remember is the constant gush of blood pouring out of me and thinking‘help me, please God help me’. At some point I am told to go on to the floor which I did and then I realised, OLIVER! Chris had to ring someone to come for Oliver. I tell him to give me the phone so he can ring Oliver’s Nana which he does and whilst I’m on the phone to the 999 lady she just kept repeating the same questions “Are you having any contractions?” “Let me know when you start one so I can time it” however, there was no pain, there was a nothingness, just the gushing sensation and no matter how many times I told this lady that there was no pain and there were no contractions, she just kept asking. The ambulance arrived then and there were two young paramedics and they started asking all sorts of questions which I was duly answering but inside… ‘help me, please’. One of the men stepped over me into the tiny bathroom and I saw his face, his pained face of not knowing where to start but just repeating to his colleague “significant blood loss” and when he stepped back over I realised that another paramedic had arrived who was the rapid response and the paramedic that was in the bathroom with me then said “this isn’t right, we shouldn’t be here, this isn’t a normal Friday night call”. It was only at that moment that I realised how utterly calm I had been since the bleeding started because it was then that I blew “Well get him out!” I screamed “NOW! GET HIM OUT NOW. Why are you all just stood there, cut me open and get him out… PLEASE” I don’t know how long this went on for but no one moved, everyone just stopped and either looked away or showed empathy in their eyes and then I felt someone touch my arm, I turned to find Vicky holding my arm, her eyes were pooled with tears and her words, Vicky’s words is what made it sink in as she looked me dead in the eye… “Sweetheart, he’s gone”. Chris sped over to me then and he hugged me and we cried… we cried for what felt like a long time just holding each other. After a while, everyone had left and Vicky told me that Kathryn was going to take over from there but that she would pop in and see me. I remember apologising… a lot! Vicky told me off… a lot! She kept telling me that it wasn’t my fault, but it must have been, I had to have done something to make this happen, what? How? Why? Kathryn broke my waters shortly after and within minutes I could feel the contractions starting and my boys journey in to this world began. 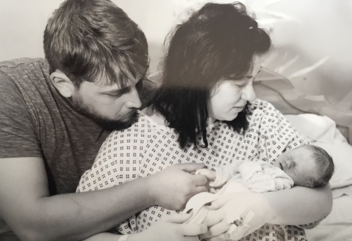 1 hour and 46 minutes after Kathryn broke my waters, at 02:16am on 7thOctober 2017, I pushed my final push and my beautiful and amazing son Samuel ‘Sammy’ Wilkinson arrived in to the world with the most deafening sound of silence. Kathryn just knew what to do and as soon as I felt him arrive he was already in my arms. And he was perfect. He was warm and had rosy cheeks and ginger hair and he was perfect. Just perfect. He just looked asleep, I held him, and I kissed him and I cradled him, the whole time crying tears I had never felt before. He just looked asleep? I kept asking if they had made a mistake, but Chris just looked at me and I knew, of course I knew but it didn’t stop me whispering in his little ear ‘wake up buddy, please…wake up’but he never woke up. He lay perfectly still in my arms just looking absolutely perfect. I held him for a long, long time before thinking that I needed to let someone know at work what had happened or I would have had clients waiting at a door that would never be open and so I passed my boy to Chris for the first time and I text Laura, through blurry eyes, the worst news I would ever have to break to anyone and when I sent it I looked at Chris and told him that I couldn’t do it again and his simple reply “and you won’t have to”. Reality has to come at some point and there were things that needed discussing. Kathryn had to ask us some very difficult questions. One of which was whether I wanted a post mortem? I must have looked at Kathryn like she had 10 heads before “No, no I don’t, you’re not touching my boy, he is perfect and you’re not touching my boy” and of course she understood and nodded. She also asked if I wanted my placenta to be tested and I said no, what does that even mean? She did explain but I was too far gone. After this she asked me if I wanted to bathe Sammy and dress him, but I just couldn’t, I was too afraid of hurting him. Ridiculous I know. 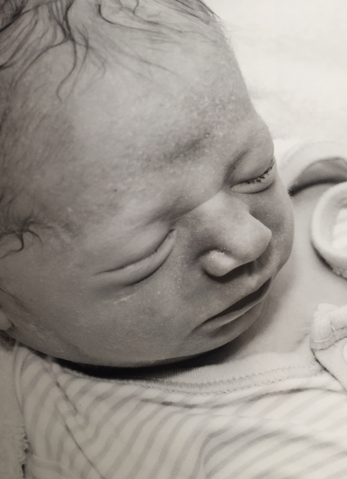 So, Kathryn took him and did all the normal checks, weighed him, measured him, washed him, put a nappy and a little outfit on him and then handed him back to me before reassuring me that I had made the right decision about not doing a post mortem because at 6LB 3OZ he ‘was just perfect’. Kathryn then brought us the 4Louis memory box and she went through it, it was beautiful but it dawned on me then that I was being given a memory box for my son, because that was all I was going to have, a few hours of memories. I didn’t even know these things existed and if they didn’t, would I have had any memories of him? It had a blanket, two teddies, a lock of hair box, a little glass Angel, hand and footprint kit, an impression kit, an SD card to store those precious pictures and much, much more. Kathryn told us that we were moving to another room and did I want a shower before I left and when I looked at myself I realised that I was still covered in blood, literally head to toe, It was that moment that I realised how real everything was. When you hear of these awful devastating stories you don’t actually hear of the realness, the raw beating you go through before during and after a miscarriage or stillbirth, not only emotionally but physically. I had lost that much blood that I had to sit in the shower and as the hot water hit my body the shower turned red and it washed away the last few hours of physical hell from my body. I sat there thinking that my beautiful baby boy was currently in the next room with his Daddy but he was never coming home with us, our whole lives had shifted and I cried. We were then taken a beautiful room, a butterfly room, where Chris and me could spend some time with our baby boy and enjoy him for what little time we had. We were provided a Cold Cot which keeps them cold so that they don’t deteriorate as quickly and we took it in turns in holding him and putting him back in the cold cot. Sheila came at 6am and she held him, and I cried and she cried and Chris cried. My body cried and ached and was confused and I still didn’t understand. We talked, about everything, about what happened, about what was going to happen. Sheila told me that she had already told Oliver that Sammy was gone, which I have to say I am grateful for because although it was a conversation that I didn’t even think of it wasn’t something that I would have wanted to do either. Chris took the opportunity whilst she was there to start ringing people and telling them what happened, which after hearing him tell Sheila, I was dreading it for him. But I told him that I loved him and he did it. Each time his voice breaking at the words that our beautiful Sammy was gone. There were messages coming through then but I didn’t have the energy to read or respond. I just needed to be with Sammy. A photographer came round and took some photos of him, him on his own, him with us and his hands and feet on ours. And I took 3 photos myself. 2 of which are personal and are for Chris and me and 1 for Oliver. 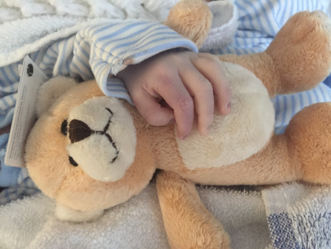 I took one of the little teddies out of the 4Louis box and I took a picture of Sammy’s hand over it so that I could take that little teddy and give it to Oliver and tell him that even though he couldn’t come home, Sammy hugged and kissed that teddy just for his big brother… a moment that I now treasure. After a few hours I could already see that Sammy was deteriorating before my very eyes and I decided then that It was something that I couldn’t watch for much longer so I had the conversation with Chris and told him that I had to leave soon. I said that I wanted to leave after 12 hours with him, I wanted 12 wonderful hours with my boy and then I had to leave. A few friends came, Kim came, Sarah and Stephen came, just for a little while to say hello and goodbye and show their support. Vicky and Kathryn came in for the last 20 minutes of their shift to just be with us and talk and we did talk, and we cried and they commented on how absolutely perfect Sammy was. I just repeatedly apologised to them for having to deal with such a horrendous thing and they told me off a lot for doing it. I asked the day Midwife Lucy to come in then and I explained that I wanted to leave at 14.16 that afternoon. She told me that there was no rush and that I could spend as much time as I wanted to with him but I explained that the longer I left it the harder it was going to be and she nodded, instantly understanding. 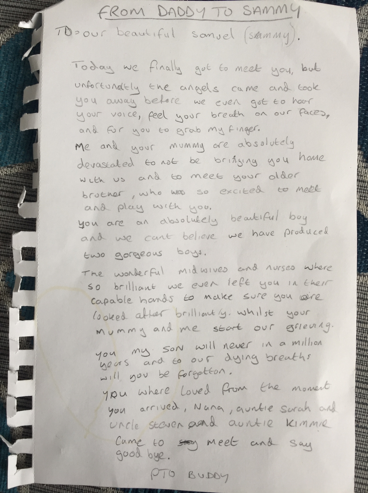 Lucy carried out all the necessary details for us to leave whilst I spent my last few hours with my beautiful, perfect son, just holding him, kissing him, stroking his perfectly soft skin, smelling him and mostly apologising to him over and over again that I had failed him. I begged whatever God there was in this world to let it be some horrendous nightmare and for me to wake up and it not be real… but I never woke up. The time came then, Lucy and another women came to our room just after 2pm with everything that we needed and we talked for a little while before she asked me where I would like to leave Sammy when I left, I didn’t understand what she meant and my face must have portrayed it because she then said would I like to leave him in his cot or in her arms? I was utterly destroyed by that question. I told her then that he is to be left in her arms and she wasn’t to let him go, ever, which is ridiculous but the thought of leaving him in a cot all by himself just left me colder than I have ever felt before. Each step forward felt like my feet were encased in concrete and I sobbed, sobbed like I had never sobbed before and at that moment I wanted to die. I wanted the world to end because I couldn’t see forward. My heart was black, a hollowness ensued and I just wanted to die. We were escorted off site and we walked past new Dad’s ringing people telling their friends and family of their happy news and we left sobbing with an empty car seat in our hands. The journey home was hell, we cried every inch of the way looking out at the world thinking ‘why haven’t you stopped?’. At some point I stopped crying, just for a moment, at a set of traffic lights, looked at Chris and said “This cannot affect Oliver” and Chris looked at me, red eyes, red nose and tears streaming and just nodded, understanding. After a while I got up and I got showered and got dressed knowing that Oliver would be home that day and I needed, for his sake, to at least look like his Mummy no matter what hollow shell it was and I promised myself that I needed to continue to do this because it would only take one day of not doing this and I would fall in to a very, very dark place. Oliver came home later that day and I tried so hard not to cry in front of him but I couldn’t help it, my body was just crying, I was broken and there was no hiding it. He knew, my 4 year old knew something had changed and he came in and gently hugged me before saying “Mummy, if there is no baby in your belly, why do you still have a belly?” and I giggled, not because I was happy but because that one comment made me realise that this little 4 year old was what was going to get Chris and me through this. The next two weeks went by in a bit of a blur, I don’t really remember it that much. I remember bits, like registering Sammy as a stillbirth and being so upset because a couple came out just before we went in all happy because they had just registered their baby and it wasn’t fair. But mainly organising a funeral for my little boy. Getting asked questions daily about what we were doing and what we wanted, flowers, donations, coffin colours, music, where, when, numbers, will Oliver be coming or not, venue after or not, what to dress him in… to many things to think about. My mind whirled around and around and I asked Chris for help but he didn’t know either. On a daily basis I begged for help but no one could help with this, this was our job, our baby boy deserved the best send off from his parents and once I realised this it all came together. Donations, not flowers, to 4Louis because that’s what made a difference to us, a white coffin because it signifies innocence and my God he was pure and innocent, at the Crematorium where the rest of our family were remembered, numbers – to anyone that felt the strength to come to such a tiny human’s funeral were welcome, a venue after to talk to those who came and tell them about our boy. We found the perfect outfit for him that was so similar to the one we originally dressed him in but I needed to keep that one and lastly, no Oliver would not attend because I didn’t want him to feel or remember that pain… ever. In between I found the energy, on the back of a high hose of diazepam, to go back to the hospital to hand deliver individual letters to the midwives with an invite to the funeral. When I arrived I was told that Lucy was on shift and to please wait because she wanted to see us. After a few minutes the lady I left my son with came round the corner and she looked shocked before hugging me and burst out crying whilst asking how I had the strength to walk through those doors again and I admitted it was the drugs that was helping. We talked for a few minutes before I asked how he was and then I broke. She told me that he was ok and that she never let him go the entire day, she just carried him around all day with her and looked after him for me and I realised that’s exactly what I needed to hear, it was only at that moment that I realised how utterly petrified I was about him being left on his own and I hated it, I hated not being able to cuddle him and look after him, I hated that I couldn’t be his Mummy. And I left the hospital again, empty handed and hollow. 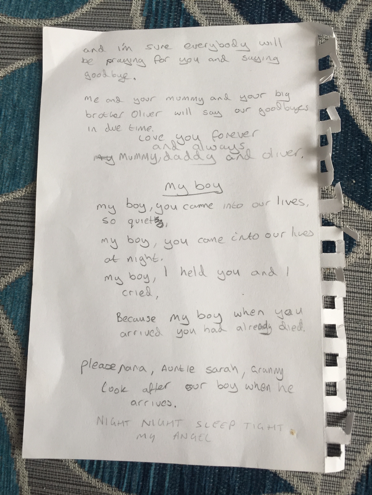 His day came, 21stOctober 2017, and the car arrived and nothing prepared Chris or me for the sight that was our tiny human’s coffin sat on the back seat of a limo and the tears came and they didn’t stop. We arrived at the crematorium to an amazing crowd waiting for us to show their support and say goodbye to Sammy. Amazingly, the first 3 faces I saw were the faces of the beautiful midwives that went through this with us and I was so pleased that they could make it because they deserved to say goodbye too. We entered to Faith Hill – There You’ll Be and we listened to Father Paul talk about Sammy and his entrance to heaven and to my utter amazement, my wonderful Husband somehow found the strength to stand up and read a little poem that he wrote the day we came home as I slept on the couch, I had never been more proud of him than that moment. When the service was over, Over the Rainbow by Israel Kamakawiwo'ole played and I stood and with every ounce of energy I had I walked over to my son’s coffin, placed the blue teddy his big brother got him on top and I kissed it before apologising one last time and telling him I loved him and I left. I greeted everyone that came and I got in the limo and as we drove away that last thing I saw were the 3 faces again of the wonderful midwives… a perfect goodbye. We woke up on the Sunday and began our healing as a family. It has now been a year since losing our beautiful Sammy and it has been a very tough one and I still do not understand what happened but I stuck to my deal with myself and every day I got up, got showered and got dressed for my other son Oliver, I needed to do it for him. I still to this day cannot speak out loud of the moment I left my newborn son in the arms of stranger and left because it’s my breaking point, I don’t know how I left. It is the most painful thing I have ever done and will ever do and I will be honest and admit that those few paragraphs took a long, long time to write because I broke every time I tried and I couldn’t breath because his face, his smell and that feeling I felt when I left him rushes back whenever I open my head and heart to remembering it… it is a pain that cannot be put into words and only a nod between grieving Mothers truly knows that pain and the one thing that I can guarantee is that none of those Mothers would ever put that pain on anyone. I received a letter a few months later asking me to come in and speak to a consultant about the results of my tests, which I was confused about because I didn’t know what tests I had but when I arrived they informed me that they tested not only my blood but my placenta too which they overruled my decision on medical grounds because of how severe it was. I was grateful that they had ignored my decision in the end because it was only with time that I realised that I wanted it testing to ensure that whatever caused it, if anything, would never happen again. Unfortunately, none of the tests they performed came back with anything, nor did I have any of the symptoms or the risk factors* so I am still none the wiser and put it down to my beautiful boy just wasn’t ready for this world, even if we were so ready for him and still, every single day, I pray to whatever God there is to ‘Please bring him back’. 7thOctober 17 – Samuel ‘Sammy’ Wilkinson – 6lb 3oz of perfection. Thank you so much Suzanne, for sharing Sammy's story. He will be in my thoughts today on his special day.